I have used Borland C++ version 5.02 to code application development projects for small businesses in my local area for years. It is a very robust software platform and a cornerstone of these custom software engagements is the “Print Preview” feature. Here I will feature an example of a check register reconciliation, which utilized my developer skills to create a “Print Preview” function. The first thing that needs to be done is to declare the classes required for the print preview window. The “TPrevWindow” class is derived from the base class of “TWindow” as found in OWL (Object Windows Library). It includes member functions for page navigation and printing. The response table in this class associates defined constants for bitmap images with their respective member functions. // through print preview pages as well as the printing function itself. // object, “Printer”, that is used throughout the code. Next, we need to declare the dialog class “TBalEndDlg” of the base class “TDialog” that will do the work of accepting user input, extracting data, etc. to prepare for the upcoming print preview operation. Here is the command that runs the dialog “TBalEndDlg” from the “TTestWindow” class, which is used for the main program window. The resource used to create the user input screen is “IDD_STATEMENTBAL”. The directive within the main window class “TTestWindow” used to construct the input control transfer mechanism is “TBalEndStruct BalEndStruct;”. The object “BalEndStruct” is specified below in the call to run the dialog “TBalEndDlg”. And here is what the “IDD_STATEMENTBAL” dialog resource coding looks like. This is what the input screen looks like during runtime. This next patch of C++ code will engage after the “TBalEndDlg” dialog call has occurred. It will commence setting up for the print preview process by first accepting a starting balance and an ending date. These will be used for the data extraction process that follows after the “OK” button in the above referenced dialog resource has been clicked. After this is complete, it will calculate the number of pages based on 50 lines per page. Then it will construct a “frame_d” object from the “TDecoratedFrame” base class. It will initialize various settings including the control bar that the buttons for the member functions are embedded in. It will also set the dimensions of the print preview window as well as enabling and disabling the navigation buttons based on how many pages have been calculated for the print preview operation. You will also notice the use of defined constants in the file input/output operations I use. These are used to set the offset in the filestreams I use to read from and write to binary fixed length data files that work with the programming. // instantiate the “TBalEndDlg” dialog class. // let’s get the Winform screen set up. // declare variables for this function. // clear out the starting amount field. // grab today’s date and assign it to the ending date input. // convert to chars to be stored in the char array “Date_”. // screen inputs and commence the data extraction process. // set the cursor to a hourglass. 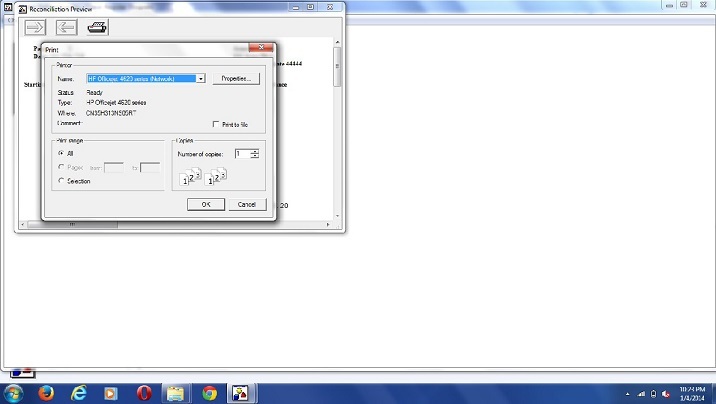 // grab data from the Winform screen controls. // format the retrieved starting amount so it is right justified. // components for further processing. // convert the starting amount to a numerical value. // binary data file to read needed data from. // get the first 2 characters of the transaction type designator. // get the first character of the transaction cleared designator. // get the first character of the transaction paid designator. // year numerical components for further processing. // less than or equal to the ending date from the Winform. // increment the line counter “PickVar” by 1. // advance to the next fixed width record in the check register. // loading the first 50 rows of the extracted check register data. // sum deposits and withdrawals with looping. // this to a numerical amount for further processing. // accumulate for deposit transactions into the variable “accum”. 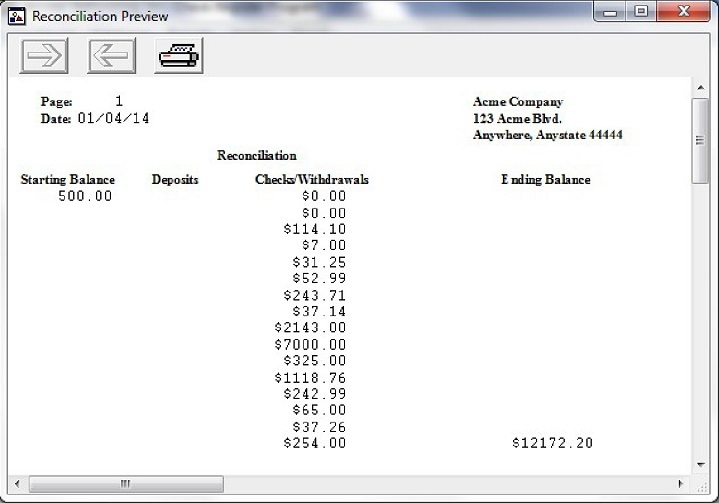 // accumulate for withdrawal transactions into the variable “accum2”. // “Xvault2_” and then increment the row counter “CountVar_” by 1. // “Xvault4_” and then increment the row counter “KountVar” by 1. // advance to the next fixed width record in the extracted check book data file. // chars to be stored in the char array “totpay”. // set the cursor to an arrow. // print preview assuming there are 50 lines per page. // this code snippet will initialize the trappings of a "TDecoratedFrame"
// are embedded into this control bar. the dimensions of the "TDecoratedFrame"
// with the directive, “frame_d->Create()”. // there are at least 2 or more pages. Below is the code under the “Paint(TDC& dc, bool erase, TRect& rect)” member component of the “TPrevWindow” class that will paint the print preview information in the decorated window frame that appears after the data extraction processing is complete. // convert to chars to be stored in the char array “var2”. // and save the current device context. // and column labels of the print preview. // char arrays “Xvault2_” and “Xvault4_”. This is what the print preview screen looks like. This next section will explore the coding used for the member functions of the “TPrevWindow” class. Immediately below I have included C++ code for navigating to the next page in the print preview window after the operator has clicked its “right arrow” button. As previously mentioned, it will move the file offset of the extracted check register binary data file “test_x.txt”, forward by 50 rows of check register transactions. // class will advance to the next page in the print preview window. // used to populate the print preview window. // initialize the variables used before commencing the "do-while" loop. // extracted check register data or to the end of the data file, whichever comes first. // and increment the row counter "CountVar_" by 1. // and increment the row counter "KountVar" by 1. // current page number and the total pages in the print preview operation. Here is the programming for navigating to the previous page in the print preview window after the operator has clicked the “left arrow” button. // class will advance to the previous page in the print preview window. // blank out the 2 2-dimensional char arrays used to populate the print preview  window. The patch of code below fires after the operator has clicked the “printer” button on the print preview window. It will show a standard windows printer dialog box for selecting the needed printer. The operator can also specify the number of copies desired. // preview screen. it allows the operator to select the desired printer to render print preview output to. // but the customer had no need for this added functionality. // set the “Printer” object to null and construct the “mData” object from “TPrintDialog::TData”. // then set the “mPageDoc” variable to the number of pages in the print preview operation. // upon clicking the “OK” button in the printer dialog screen, proceed with as follows. // number of pages in the print preview operation. // print preview by 1 page until you are viewing the first page of the print preview. // printer for the total number of printed copies desired. This is what appears after the “print” button has been clicked. After clicking the “Print” button on the printer dialog box, the output is rendered to the selected printer using the code below. // to a selected printer from the printer dialog. // instantiate the “T2Printout” class. // this will render the print preview output onto the selected printer. // units to one inch of screen width. // call the window to paint itself. // restore changes made to the DC (device context). This print preview code has proven itself to work reliably in Windows ME, XP, Vista and 7. If you are coding in the Borland C++ 5.02 platform, it will serve as a decent framework for facilitating a print preview operation. Some of my best customers have used this for years. Aside from my programming services, please visit my website to learn more about my computer repair services and my "fix my computer" technical tips.